Refer Friends, Earn Free Stuff! As of today there are 118 of us Riptide believers - we gotta stick together while also getting others to join the tribe! To further incentivize you all to share the R1, as of today you'll earn perks when you refer your peers to the campaign and they purchase a board. 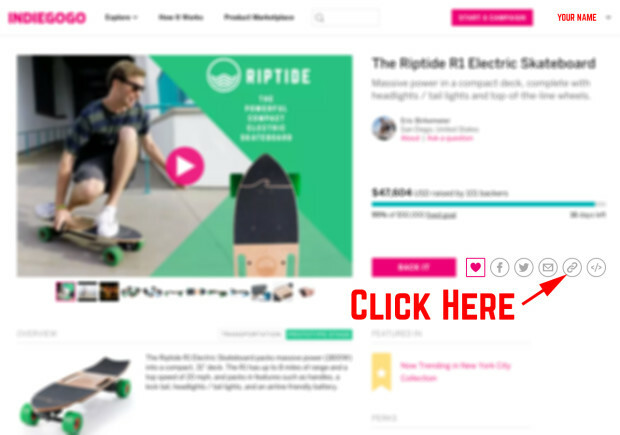 Note that if you have not backed a board you'll need to create an Indiegogo account before following the steps below to get your unique code. Note: This cannot be combined with other offers. This program only applies to new referrals and orders. If you cancel your backing and re-order through a referral link it will not be counted as a referral. This program only applies going forward and does not apply to previous referrals, whether they were tracked or not. This program is only open to backers in countries we ship to. Do not post your code to Riptide social media postings as it will be taken down. **If you have an R1 on pre-order, these will allow you to upgrade to an R1 Elite. If you have an R1 Elite on pre-order, you will have these as backups or you can throw them on another board. ***Intl shipping payment required. ****This can only be used on a purchase made through our website after the campaign closes. This $100 off credit cannot be applied to boards ordered through the campaign. Copy this link and share it with your friends, family, and on Social Media. We'd love it if you could help get the word out there to help our project hit its goal and beyond, all while earning some sweet free perks. To track referrals click on your name, then click "My Profile", then click on the "Referrals" perk. Referrals will be calculated 15 days after we receive funds from Indiegogo. Only board level referrals will count. Thanks!